On July 20, 2015, Mr. Nguyen Yen Hien, Vice Chairman of Yen Bai People's Committee signed the decision to convert more than 13,000 square meters forest land to residential land for Pham Sy Quy's family. Decisions No. 2356, 2357, 2358, 2359, 2360 and 2361, declare a total area of 13,000 272 square meters of forest land into residential land. On 02/6/2016, Nguyen Yen Hien himself signed the Decision No. 1639 / QD-UBND to convert 308 square meters for Mr. Quy's family. In September, 2016, Pham Sy Quy was appointed as Director of the Department of Natural Resources and Environment of Yen Bai province. Photo Resource Resources Environment. This abrupt decision, granting 6 Land Title Transfer Request in one day, adds 13,577 m2 to the family of the Director of the Department of Natural Resources, is an immense block of land in Minh Tan Ward. The land titles are interestingly named under Mr. Quy's wife, Hoang Thi Hue, born in 1975, resident of 51, Minh Tan Ward, Yen Bai City. The grounds that Vice Chairman of Yen Bai People's Committee based his decision on is the Decision No. 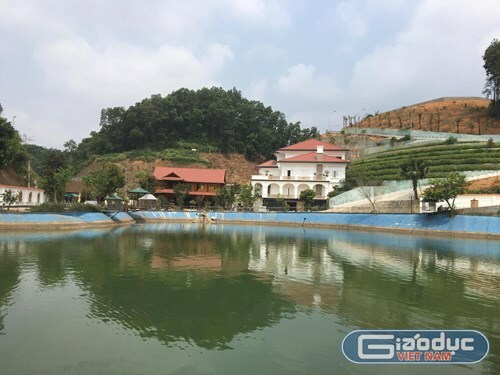 666 / QD-UBND dated 12/5/2014 of the People's Committee of Yen Bai province which allows "the approval of adjustment of regulations Land use planning up to 2020 and the 5 year land use plan (2011 - 2015) of Yen Bai city ". The Department of Natural Resources and the Environment, where Mr Quy is the Director, is the lead agency that coordinates with other relevant agencies in making and adjusting the plan for land use of the region. Decision No. 666 / QD-UBND dated 12/5/2014 of the People's Committee of Yen Bai province states the "Agency as the owner" and only mentions "people", not any specific family. The "total projected area" is 2.98 hectares, of which 03 hectares is paddy land, while the rest is 2.68 hectares. The decision also specifies the time of implementation. Thus, Mr. Quy's family went ahead of the "people" when in July 2015 they completed the conversion of the 2.68 hectares of "other land" that should've been allocated to the people but instead has been monopolized by the said official, which is more than 1.3 hectares (accounting for nearly 50%) of the area. One of the proponents of these decisions is the Chief of Natural Resources and Environment of Yen Bai City which is Mr. Quy's subordinate. In an interview conducted by the Vietnam Education Newspaper, Mr. Pham Sy Quy initially denied allegations of land grabbing. "It's not my house. Why do I have so much land?" Mr. Quy said. When asked whether: "His wife's name is Hoang Thi Hue and if she was born in 1975?, Mr. Quy again exclaimed: "Hue is my wife, but the land is not mine ...". 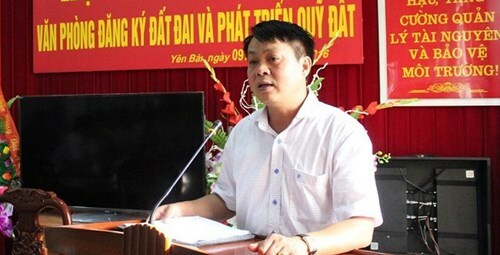 During the course of the interview,after the reporter presented "indisputable" evidence, the new Director of the Department of Natural Resources acknowledged that this was his family land and that he was himself "accountable" to the provincial leaders. .
On the same day, Mr. Nguyen Van Khanh, Vice Chairman of Yen Bai People's Committee confirmed that this is the family land of Mr. Pham Sy Quy, Director of the Department of Natural Resources and Environment. "I have learned this and the province is also asking the People's Committee of Yen Bai City and the Department of Natural Resources and Environment to clarify the process and procedures for conversion. The province is also asking Mr. Quy to explain the report ... "Khanh said. Vietnam's Education Newspaper correspondent also worked with Mr. Do Duc Duy, the Chairman of People's Committee of Yen Bai province. Although he was aware of the content that the media was verifying, Mr. Duy refused to speak and instructed reporters to speak with the provincial chief instead. "The fact is that Mr. Pham Sy Quy, Director of the Department of Natural Resources and Environment of Yen Bai Province, "overtook" more than 13,000 square meters of forest land and fishery land and converted them to residential land for the construction of large-scale structures was acceptable? Who is standing out shielding, let the authorities and individuals do so? On 09/9/2016, Pham Sy Quy (b. 1971) was succeeded by Pham Thi Thanh Tra, now president of the People's Committee of Yen Bai Province (now Tra is the Secretary of the Yen Bai Provincial Party Committee). Appointed as Director of the Department of Natural Resources and Environment. Pham Thi Thanh Tra said in the press that her appointment of Mr. Quy was a statutory act in the position she was in, not an individual decision. "The appointment process is extremely tight, nothing to call love in this case," Tra said.